It's been almost a year since I saw Memphis on Broadway (previous post here)so it is real fun to see it again as I get to bring some friends to see it for the first time. Produced by Broadway Worldwide, it's probably the first Broadway show (still currently running) to be film live and shown in movie theaters. The movie opens with a behind the scenes look at the musical with interviews of the creative team. While it was nice to get a backstage look, my friends thought it was unnecessary. It would have been more appreciated if they had placed the interviews during the intermission. It's a well shot movie of a live show. The camera angles, sweeping movements as well as the choice of zoom and wide shots were very fitting for the scenes on stage. Director Don Roy King did a real good job with these choices. I actually appreciated this more than the filmed live version of RENT which had jarring shots. The sound for the movie captures the deepness and fullness of the singing of the live show. As for the cast, Montego Glover is still as great as ever in the role and her voice is golden. I still feel she should have won the Tony. Chad Kimball has a very appealing voice but his physicality and drawn out slurry accent is more annoying in this medium. Even my friends Jon and Abbi, not having seen it live, were also annoyed. It was also very engaging to see James Monroe Iglehart tear up the stage again during his big number and see the ensemble dance with full energy. I have to say that if you can't be in New York to see this live, it is the next best thing but it does lose some of the intimacy, spontaneity and connection that you get with live actors on stage. 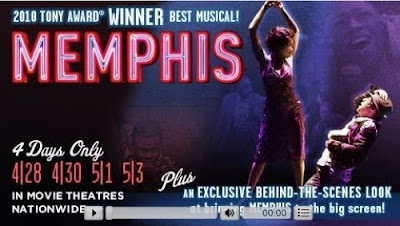 Edit (5/4/11 10:58 pm): For those who saw Memphis on film, please answer this survey from Fathom Events and recommend more theatrical productions to be captured on film.